Lawyers, like high-pressure used-car salesmen, want you to sign on the dotted line right away. Like all businesspeople, they understand the value of inertia–if you don’t hire them now, then it’s not likely that you’re going to hire them later. My goal is for you to get good representation when you need it. Maybe it’s me. Maybe it’s another lawyer. I just don’t want you to lose your case. Partly, this is because I’m a plaintiffs’ lawyer. Helping people is what I do. Partly, this is because I understand that businesses and insurance companies sometimes take advantage of people, which isn’t very nice. NOTICE (within 180 days of accident): If the negligent driver is employed by a local government (like Baltimore City or Prince George’s County, or any police department), or if the local government is somehow at fault (for example, operating defective stop lights), then you must file a formal notice of claim within 180 days of the accident. That’s only 6 months, and the notice must have very specific information. You can find these rules for Local Government Tort Claims Act in the statutes, MD. CODE, CTS. & JUD. PROC. § 5-301 et seq. Just because you provide notice doesn’t mean you have to file a lawsuit–notice preserves your right to file a lawsuit and make a claim. Without it, you lose before you even begin. NOTICE (within 1 year of accident): If the negligent party was the State of Maryland, or employed by the State of Maryland (or Baltimore City police), formal notice must be sent within one year of the accident. This is called the Maryland Tort Claims Act, and is found in MD. CODE, STATE GOV. ART. § 12-106. Again, this isn’t a claim, just notice of a claim that preserves the right to make a claim for damages later. NOTICE (within 1 year of accident): If the negligent party was the Maryland Transportation Authority (for example in a bus accident or light rail accident), formal notice is also required within one year of the accident. The notice must be sent to the MTA’s administrator under MD. TRANS. ART. § 7-702. PIP APPLICATION (within 1 year of accident): If you carry automobile insurance, your Personal Injury Protection policy, if you have it, will pay for lost wages and medical expenses. However, you must apply for this right within one year of the date of the accident. Then, you have until three years after the accident to submit copies of all medical reports and bills that you wish paid. NOTICE (within 2 years of accident): If the negligent party was the United States government, or employed by the U.S. government, then notice is required within two years of the date of accident. 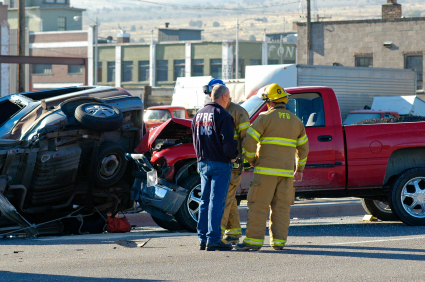 Most auto accidents involving the U.S. government that we see are claims involving United States post office employees. STATUTE OF LIMITATIONS (within 3 years of accident): Unlike the prior notice claims, the deadline to file an automobile collision lawsuit in Maryland is typically within three years from the date of the accident. If the case has not previously settled, and if a lawsuit is not filed within three years, the case cannot move forward, and the injured person will not be able to recover. OTHER: Of course, there are other reasons to hire a lawyer early on. Most of this has to do with evidence–witnesses disappear, red light and traffic cameras/video is lost or recycled (sometimes within weeks), and 911 calls don’t last forever. A lawyer can quickly identify what evidence will help your claim, and can secure it so that it can help you when needed at trial or in settlement negotiations. You can contact us at anytime if you have questions about your case deadlines. We are responsive to phone (office: 410.252.0600, cell: 443.850.4426) and e-mail (jcord@charmcitylawyer.com), or you can send us a message through our website here.